I had wanted to make a spot welder for a while. 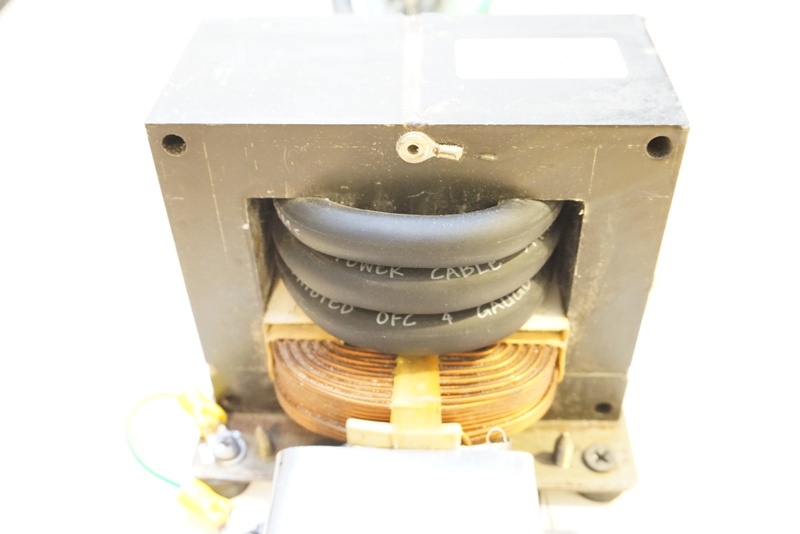 Most of the DIY spot welders use a momentary switch the primary side of the microwave oven transformer (MOT). Due to the simplicity of this design, it is very simple to make. 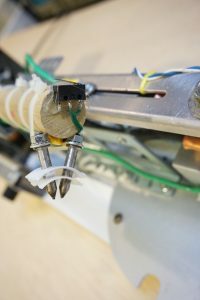 This design however, has some inherent safety issues as the momentary switch is typically within reaching distance of the operator (unless a foot switch is used) and inadequate insulation could increase electric shock risk. Further more, the current flowing through the primary winding can significantly exceed the current rating of the switch and cause the switch to fail. Due to the inductive nature of the winding, the switch can sometimes arc over and pose significant risk to the operator. Another problem of these simple spot welders is that the welding duration cannot be precisely controlled. This is mostly a problem when welding tabs onto battery terminals as excessive welding time can cause the battery terminal to heat up significantly which could shorten the life of the battery. So I set off to design a simple circuit that addresses these issues. To switch the primary of the transformer, I used a TRIAC (BTA-41). BTA-41 is rated to handle 40A of current and is more than adequate for our purpose. C4 and R8 forms a snubber network for transient suppression. The TRIAC is triggered via an optocoupled TRIAC driver (MOC3061). By using an optocoupler we can isolate the control circuitry from the mains voltage and thus make the operation a lot safer. To control the welding time, an 555 timer is configured in single shot mode (click the circuit below to see the high resolution version). R2, R4 and C3 together determines the output pulse width. Given the values used, the welding time can be adjusted between roughly 0.1s and 0.6s. The timer is triggered via R3 and C2. The reason an RC circuit is used for the triggering (as opposed to connecting pin 2 directly to the ground) is that the pulse width generated via charging C2 through R3 is significantly narrower than 0.1s and thus we can guarantee the minimum pulse width. Otherwise, if we held pin 2 at ground level manually, the minimal achievable pulse width would be depended upon how fast we ccould release the switch for as long as pin 2 is held low the output would be high. Two momentary switches are used for the triggers. One trigger is for using the main welding tips and the other is for the battery welder tips. For the MOT, I removed the original high voltage secondary winding with a saw and manually wind a 4 AWG wire through three times. This produces an open circuit voltage of roughly 3V (AC). the secondary is then crimped onto two battery terminal lugs. With the transformer I used, the shorting current on the secondary is close to 1kA. Although we are dissipating more than 3kW while the transformer is only rated for 1.3kW, we are operating in pulse mode so there is no danger of overheating. The pictures below illustrate the two sets of welding tips. The main welding tips is configured opposing each other. They are secured onto the terminal lugs via M5 screws. I used a salvaged server mounting rail as the lever. The main welding tips are useful for welding two metal sheets together but to weld battery tabs, we need both welding tips to be adjacent to each other. So I made another welding tip as you can see from the picture to the right below. Since the material used for battery terminal welding are typically thin nickle strips, the welding time is typically very short (e.g. 0.1s) and the current does not need to be as high as welding thicker materials. For this reason the tips and wires I used are significantly thinner than the main welding tips. And the current through the battery tab welding tips is roughly 200A. These two sets of welding tips are both connected to the secondary of the transformer and either set can be used at any given time via either of the momentary switches. I also built a holder so the battery tab welding portion can be stored on the main lever when not in use. The following is a picture of the circuit board. 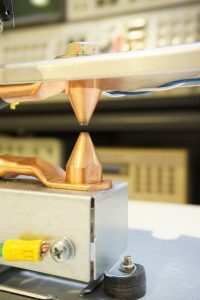 The TRIAC is mounted on a small heatsink. Since the welder only operates periodically not continuously, the TRIAC never gets too warm. Finally, here is a short video including some demonstrations. Are S1 and S2 redundant? Apparently one is for the larger tips and the other for smaller tips, but they both seem to perform exactly the same function electrically? Is one a panel-mounted switch and the other a foot switch? Also, what is the purpose of R7? Did you have problems with undesirable TRIAC switching? In my experience R7 only served to reduce gate drive, which is usually controlled by R6. S1 is for the main welding tips and S2 is for the battery welding tips. So yes, either one would work but it’s just more convenient for the switch to be close by depending on which tips you are using. The triggering circuitry (including R6 and R7) is using the reference circuit provided in the datasheet. I have not had any issues with TRIAC triggering. Thanks for responding quickly to my questions! The use of two switches in different locations seems logical to me. As far as R6 and R7 vs. a (lower value) single resistor in the R6 position, I think the two-resistor solution is safer. The presence of R7 reduces the likelihood of stray triggering, and the slight impact it has on on-time is not much of an issue; you can easily tweak the one-shot pulsewidth of the 555 circuit to compensate (if necessary). Good job! 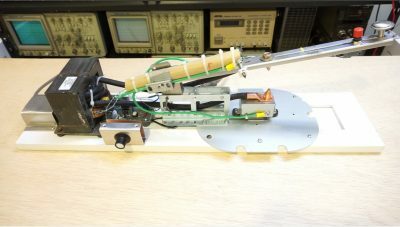 Hi, this is a great project, and it is inspiring me to build a similar pulse controller where I plan to add the possibility for a double welding pulse. I may be using an MCU, so I can easily add a display and stored pulse durations, but I could use the same triac driver circuit you describe here. I have been planning to use a random-phase optocoupler (e.g. in the MOC30XX range) based on the fact that the load (the MOT) is of inductive type. I see you used a MOC3061, and it looks like you are not having a problem with the switch-off of the triac. Did you observe any problems in this area? If not, do you think this is due to the snubber network limiting dv/dt for the voltage seen by the Triac when it switches off at zero current? Hi Kerry, thanks for the quick feedback. This is great as I have some MOC3043 (zero-crossing drivers) already available, so I can move on quickly and prototype it using what I have already. Where are you getting your 5v for the timer circuit? 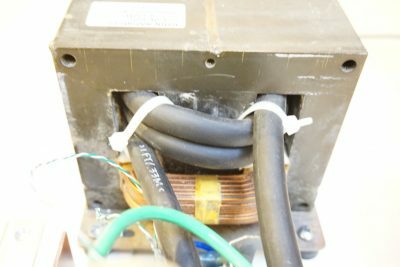 I used a separate power supply which is tucked under the main transformer. The circuit should work under 220V without any change as long as the components are properly rated. The NE555 gets hot after 30 sec from connecting to Power supply. I checked Everything and nothing is faulty. Even the same NE555 used in other Circuit works fine. My second question is about the AC side. What voltage at Points 1, 2 of T2 do u get while the timer side not effective yet? I’d love to have a copies of both the populated pcb pdf file and the Eagle circuit board file. Thanks! Sorry first post with wrong mail adress. The first part is solved, C3 was bad and changed, works great. I’m changing R4 with 10 turn for better time Control. My second question about the voltage at T2 pin 1 and 2 still acti´ve though. Could you confirm the output from the timer when you activate the momentary switch? Does it change at all? 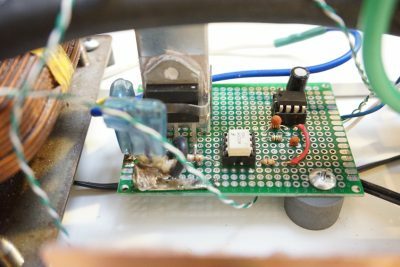 The MO3061 side is really simple and as long as you get a trigger pulse from the timer output, the optocoupler portion of the circuit should work with no issue. The next thing you want to check is whether the TRIAC is working properly. I have output on pin 3 and Changes well with R4, likewise i can see the optocoupler conducting on the AC side. The problem is that i measure same AC input voltage at T2 all the time even with the timer side off (no Power at all). The triac i’m using is QK040K7 (original – Littlefuse). Can i upload a populated pcb PDF file here? An easy way to isolate the issue is to remove the 555 timer circuit and short the input (pin 1 and pin 2) of MO3061. The TRIAC should remain off and not triggered. If you still see transformer powered, I would try measuring the voltage across R7 between the G and C of the TRIAC and if there is voltage then MO3061 is most likely faulty, otherwise your TRIAC is faulty. Well turn out Everything is fine. Tried with Another MOC3063, BTA08 with sames results. Both optocouplers and triacs tested ok. Reinstalled QK040K7 and MOC3601, tested fine this time, BUT with T2 connected. First measurements were done without T2 connected, was just probing terminals at board. Any explanation why the cirucuit behaved the way it did without T2 installed? Any way all testing done using variac at low AC voltages. If you try putting a load (e.g. a incandescent light bulb) in series with the primary of the transformer does it light up depending on the 555 output? Yes it does. Likewise Reading on secondary of transformer depending on 555 output. So looks like it’s working correctly? I might not have totally understood the original issue you had? If you would be so kind, I’d love to have a copies of both the populated pcb pdf file and the Eagle circuit board file. I’m in the process of making one of these projects and would love to build the final version with the custom circuit board. Thanks! The issue was at T2 primary side on PCB (without T2 connected) i got same input voltage from variac at A1 and G of triac. But as soon as the T2 was connected the issue disappears, an explanation would be appreciated. Greetings, may I ask what is the power rating of R8 and what type of capacitor is C4. Suppose you are dealing with 110V mains voltage, you can use a ceramic 300V capacitor for C4. The current through C4 is extremely small due to large reactance (> 250K) so a 1/8W resistor will be sufficient for R8. Great job designing that isolated control circuit Kerry, so safety is maximized. I’m collecting parts as we speak to build my own version with your control circuit. Thanks!!! I am just getting the timer side of the pcb finished and I don’t have a 100uF capacitor for the pin 6 and 7 lead to ground. Could I use something close without messing things up to much? That capacitor controls the delay interval in conjunction with the potentiometer so you can choose from a wide range of values (anything between 47uf to 200uf should be fine). Thanks so much. This is a awesome project with safety in mind. Great job and keep up the great work. (1) In the picture of the circuit board, what is the blue thing in the left front corner of the board? (2) What is under the metal cover where the AC power cord comes in? (3) What is the description/part number for the potentiometer? Hi Sandy, to answer your questions: (1) this is just a spade connector. (2) There is a 5V supply that powers the timer circuitry. (3) the part number of the potentiometer is not critical, one with value between 50 to 100K would do the trick. Do I have to make any changes to the circuit if I use it with 220V power? No, the same circuit can be used as long as the snubber cap C4 is properly rated. I am interested to learn about dual pulse timer controller circuit only can you please send me PCB design or Schematic. I want to use dual pulse circuit board to control battery source spot welding but the problem is there is pre made timer controller dual pulse available for it please help me out to make it better way. With an 50k pot and a 100u cap it is closer to 6s. 0.6s would require a 5k pot instead. If I calculated it right.